Home Date Interview Questions Difficult Date Questions How to find number of months between two given dates in Java? Write a program in Java that prints number of months between two given dates. For finding number of months between two given dates we are using below algorithm. Convert both given dates to Calendar. Get number of years between two dates using Calendar class method public int get(int field) and constant YEAR. Total number of months = 12 * number of years + (number of months in two calendar dates using Calendar class method public int get(int field) and constant MONTH). Finally get number of remaining days using Calendar class method public int get(int field) and Constant DAY_OF_MONTH. How to get all the information about any given date? Output - How to find number of months between two given dates in Java? 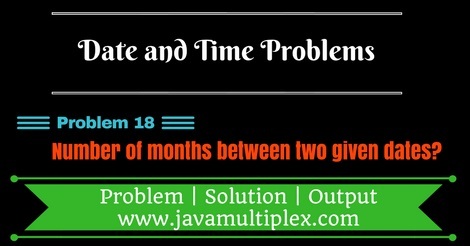 Tags : Date and Time problems, Number of months between two dates in Java, Solution in Java, DateFormat, SimpleDateFormat, String, Regular expressions, if else statement.